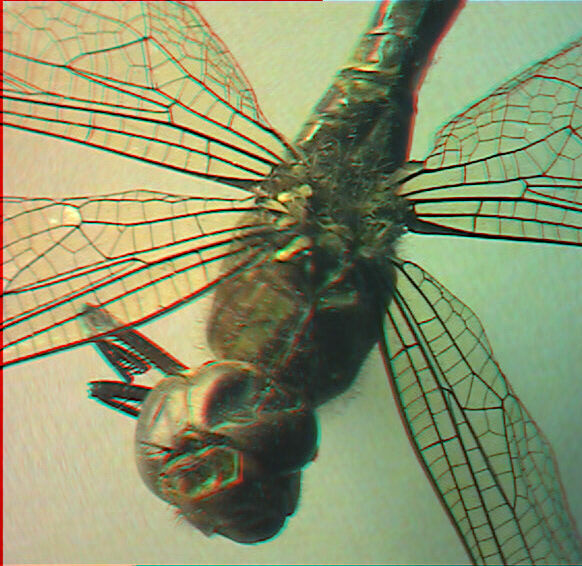 Download The 3D Dragonfly Screensaver! I love Dragonflies. To stand close by a pond or a river in summer and witness these giant insects move through the air in complete control, their helicopter-bubble eyes taking in a panorama - the like of which I will never see through human eyes - fills me with wonder! When my friend, John Wells, an ardent microscopist gave me a small cardboard box on a visit to his house one morning, it wasn't until he said - "I'm afraid I will have to call my cat St. George...", that it dawned on me what was in the box. Inside was a fallen Dragon... or more precisely: a somewhat dried up and damaged dragonfly! A sad sight to see such a beautiful creature now looking more like a broken toy-flying machine, its sophisticated giant eyes - now dented dead spheres. Still, even in this sorry state, it was an opportunity to take a look at what was left of its structure under a microscope. 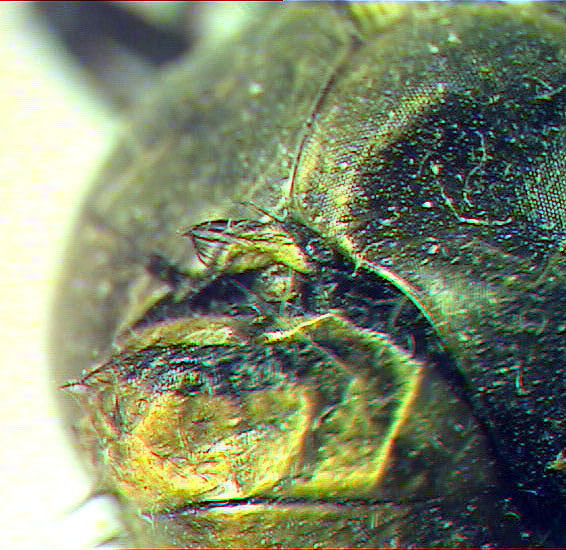 I thought you might enjoy what I saw with my stereo, and you might find these images and article an inspiration to become more interested in these extraordinary insects. 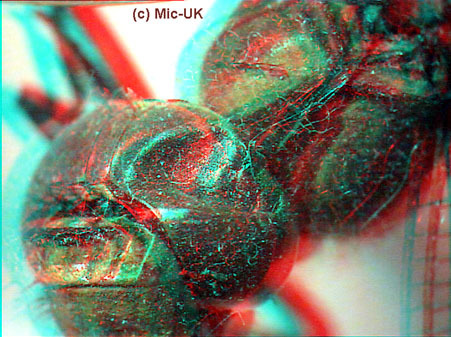 I have made all the images in 3D to try and show Dragonfly structure more realistically! "A fallen Dragon! Right eye - dented. Front of head - torn!" Dragonflies, along with Mayflies, make up one of the oldest order of insects - the Palaeoptera. They are over 300 million years old! Their ancestors were known to have wing spans of 70 centimeters or more (approx. 27 inches). Their importance to humans, other than their bright colours and inspiration to artists and designers, comes from the fact that their larvae feed on many types of aquatic prey including mosquitoes - which are vectors of serious diseases like Malaria. You can see in my image below, a rip in the front of the head of this fallen giant - probably the result of a 'playful' cat paw! In Britain, over 90% of the habitats supporting Dragonflies have gone, leaving them at risk from gradual extinction. "A fallen Dragon! Front of head - torn!" Published in the April 2000 edition of Micscape Magazine.